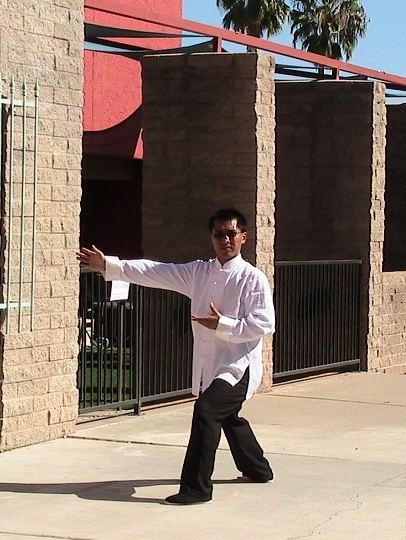 On November 6th 2012, Master Zhao, Junming came to Green Valley from Tucson and held a tai chi workshop for Golden Bamboo Tai Chi students and Taste of Tai Chi students. Master Zhao was trained at the Songshan Shaolin Vocational Institute of China and is sponsered here in the US by the Confucius Institute at the University of Arizona. Click to see the video of Master Zhao's performing the Chen 26 form. Master Zhao led us in tai chi and Qi Gong exercises and taught us the first part of the Chen 26 form. The guy in the green shirt was doing it all wrong. Master Zhao has a good sense of humor and cracked us all up.